I explained that visitors from all over the world are fascinated by Guatemala’s chicken buses. They find them to be charming, colorful and delightful. In fact the Mexican mega-tourist destination of Ixcaret, near Cancún, has fashioned all its shuttle buses to look like the chicken buses in Guatemala. They are painted in bright psychedelic colors and patterns, including a roof top of big baskets full of artificial fruits and vegetables and others containing plastic chickens! 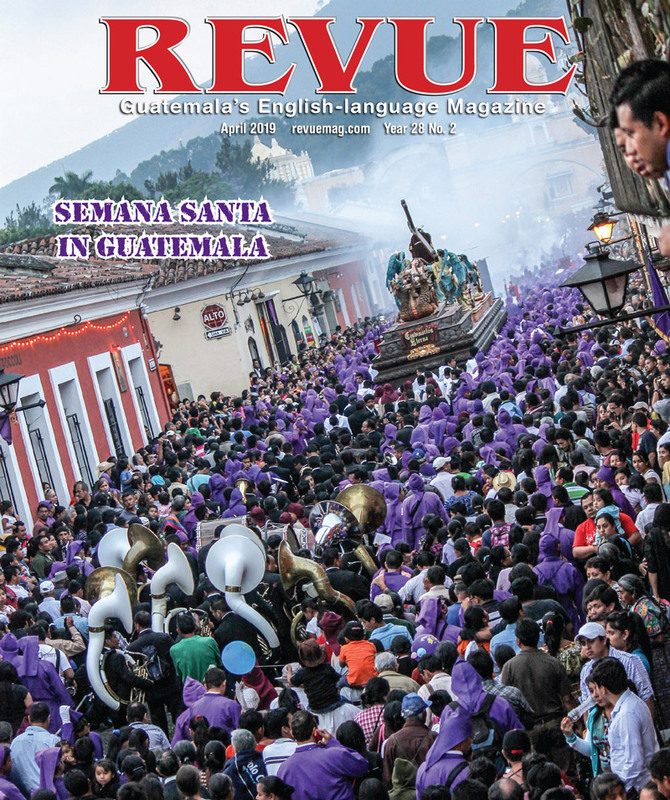 Many tourists do not visit Guatemala to see modern infrastructure, they come here to experience authentic Mayan culture with all its rough, rustic, rural charm—all part of the country’s magic. I can recall some wonderful experiences while riding on chicken buses. More often than not the atmosphere is festive, and the people are very friendly. At many stops ubiquitous street vendors offer a cornucopia of food and drinks, including steaming hot chuchitos, which are kiwi-sized corn husk packets of masa filled with tomato sauce and some kind of meat, usually chicken, ek, or pork, ak. Chicken buses were given this nickname for a good reason. If you take to riding on rural buses, inevitably you will share space with a basket or two of live foul, held in place by a twine-net covering that allows the birds’ heads to stick out … cluck, clucking! 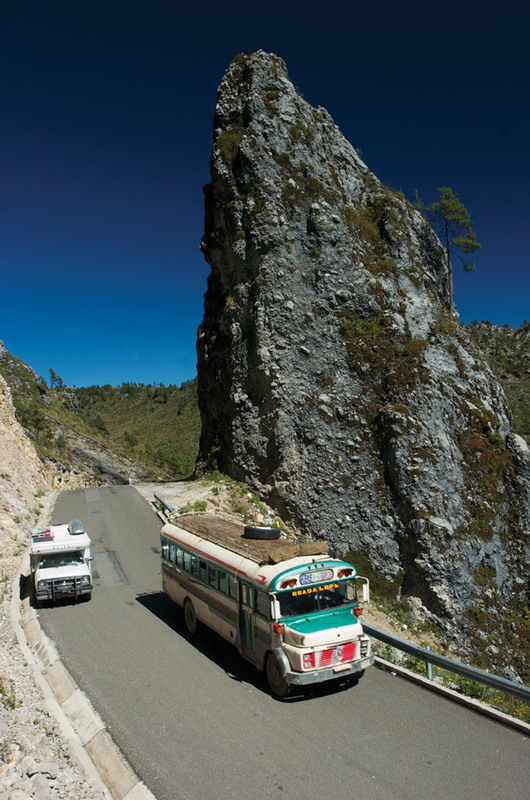 On one occasion I was traveling in an old Bluebird bus that was making its way slowly through the mountains of El Quiche province on its way to Nebaj. Everything was going well, and I was having a great time hobnobbing with some women who were returning home with variety of domestic items purchased at Guatemala City’s big terminal market. Suddenly, I felt a strange sensation on one of my feet—something warm, something liquid. “What’s that?” I looked down at a small boy who was smiling at me as he continued to weesh (tinkle) on my foot! His mother quickly reoriented the boy’s direction as all the other women laughed heartily, “Ay pobrecito gringito… como lo siento,” chuckled the mother. Ah, yes, for sure, if you don’t have a good sense of humor, a gregarious disposition and a lot of patience, transportation via chicken bus is probably not for you. But if you love people and would like to get a better feeling for the culture by experiencing how most Guatemalans live, then, for sure, take a ride on a rural bus and find out what “livin’ it up” Mayan style is all about. Although in general I would say that while I have enjoyed traveling on chicken buses, in recent years many drivers have become highway daredevils. This kind of reckless behavior should not be tolerated. Essentially, in rural Guatemala, there is no speed limit. Drivers can go as fast as they like. In other words it is like the “wild west,” and chicken bus drives, in particular, take full advantage. Anyone who travels the roads of Guatemala knows that what I am saying is true. On the other hand, many chicken bus drivers could be rated as very good drivers, they must be to survive, since daily and commonly they take exaggerated risks. 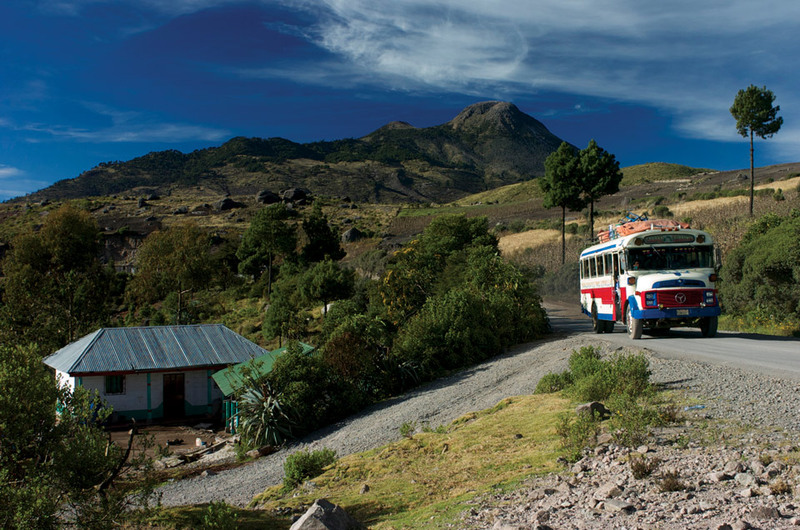 During Guatemala’s “internal conflict” I had more than one harrowing experience aboard rural buses that plied the route between Chimaltenango and Sololá. At that time (1980-81) driving your own vehicle was like playing Russian roulette—there was always the chance that you would be stopped by the guerrillas, who might burn your vehicle or worse. So it became the routine of many, including myself, to travel on local buses. This did not mean that there weren’t some interesting and even hair-raising experiences. Army checkpoints were common. The drill was always the same, passengers were obligated to disembark, and the men had to form a line on one side and the women and children on the other. The men would be patted down and their bags searched but the women only had their luggage checked; they were never subjected to a pat down. I often wondered how many ladies were smuggling a pistol or some other forbidden item under their voluminous skirts. One morning an oncoming bus flashed its lights incessantly. Our driver slowed and steered up close so he could shout to the other driver. I noticed something queer about the other bus. It had big brooms tied onto the front bumper as if they were there to sweep the highway. Up ahead someone—you never knew who was doing what—had dumped thousands of big tacks (designed to puncture tires) all along the road. Our driver was already prepared for such an eventuality because he pulled the bus over and rigged up his own brooms. That being done, we continued on slowly, making our way through the low-tech mine field. Another event is indelibly burned into my memory. One night we were zooming through the endless curves between Tecpán and the crossroads at Los Encuentros when, as we came around one particularly precipitous bend, everyone gasped! We looked down into the valley and saw an entire village on fire. You can be sure that everyone was saying a prayer that night. When the bus finally made it to Panajachel, my companions and I stopped at Chalo’s tienda for a cold beer or two. Everyone listened with rapt attention as we related what we had just witnessed. Unless you drive a heavy-duty, four-wheel drive vehicle, the chicken bus continues to be the best way to get to remote destinations, as most rural highways are still unpaved. And in more remote areas, such as the stretch between the frontier town of Barillas, Huehuetenango and Playa Grande in Alta Verapaz (an area bordering Chiapas, Mexico) the roads are so bad that buses must go very slowly, thus precluding the daredevil antics of drivers transiting paved routes. Passenger vans and mini-buses have become ubiquitous in recent years, and this is probably a more acceptable form of transport for the less adventurous. 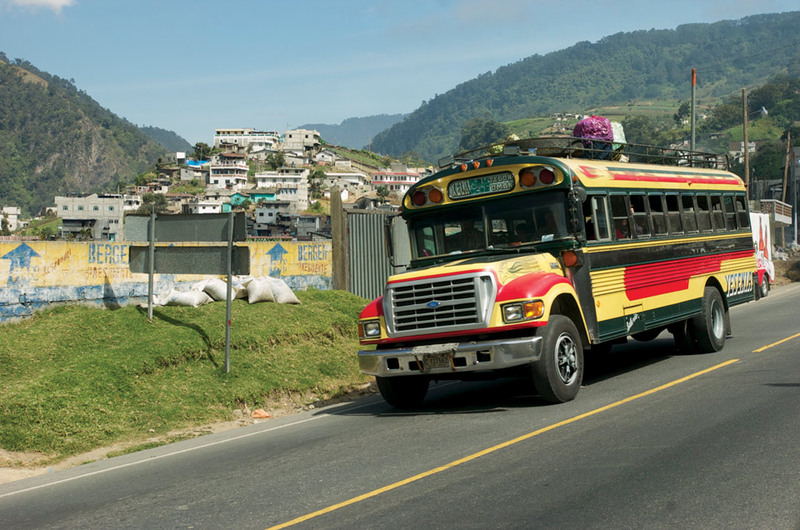 Speaking for myself, after taking thousands of trips aboard Guatemala’s famous and infamous chicken buses, I would still recommend riding a chicken bus. There is no better way to get to know the locals and experience something of their way of life. If you are adventurous and open minded, you will find this kind of trip utterly charming and unforgettable. And it would not be an exaggeration to say that the Maya are exceptionally friendly, courteous and inviting. Good article. You’re not only an excellent photographer but a good writer. You could have mentioned that each bus is baptized with a Chritian name, often a Catholic protective patron. Personnaly I stopped traveling in ‘chicken buses’ because the drivers play loud, very loud music and do not respect the passengers’ request to lower the volume. It’s an unhealthy mind pollution. I really enjoyed this article. Thought your perspectives, experiences and photographs were just great. 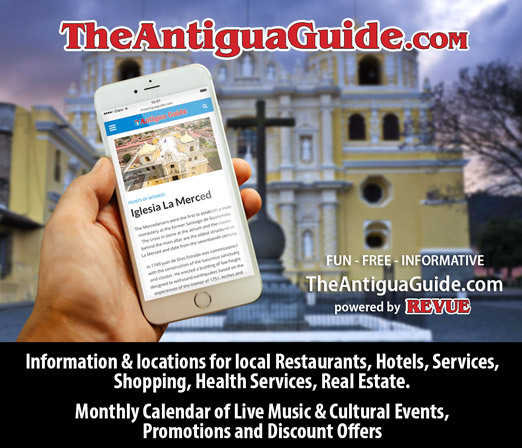 By the way Thor, I have purchased 5 of your photographic journals of Antigua. One of the best books I have seen, especially for State Side friends and family. I even donated one to my little hometown library in Michigan. Keep on keeping on!!! Great Article and the pictures are amazing! I have also traveled a bit on the “chicken buses” and honestly it was not as bad as I thought it would be. 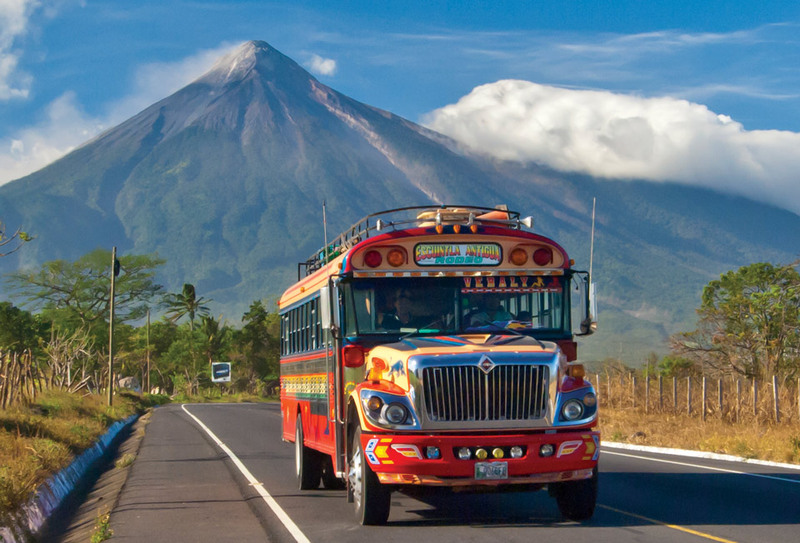 I took the so called “pullman” bus from Huehue to Guatemala city and that was a lot nicer and more secure as it does not stop on the roads anywhere to pick up passengers. Although if you do this you will miss the chance to mingle with the mayans. Me encantan los buses tan coloridos en Guatemala.